The courses are suitable for Christians with a basic grounding in the faith, but who want to increase their knowledge of God’s Word to help them in their Christian lives and service. Some courses aim to introduce topics, while others will build on previous courses to deepen engagement with the topic. 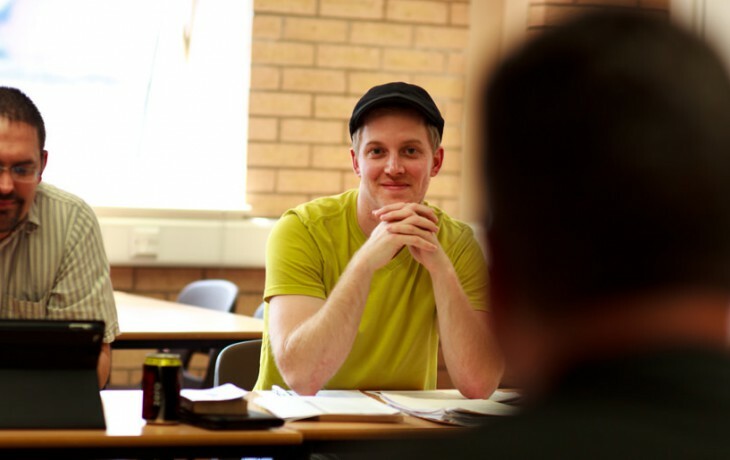 Courses are offered on Monday evenings over two 5-week periods; one in the autumn, the other in the spring, from 7:30pm-9:30pm including a mid-session coffee break. They are held in the Emmanuel Centre here at NTC. 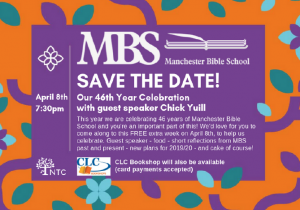 This year we are celebrating 46 years of Manchester Bible School (in its current form) and you’re an important part of this! We’d love for you to come along to this FREE extra week on April 8th, to help us celebrate. Our guest speaker is Chick Yuill so why not join us for an evening of short reflections from MBS past and present, some teaching and thoughts from Chick, hear about new plans for 2019/20 – and of course there’ll be cake and food! Student Discount on books with CLC Bookshop! If you want to carry on exploring the things you’ve looked at on your MBS course CLC Bookshop will be joining us throughout the evening and will have available a number of books relating to the topics we’ve looked at through MBS this term. A minimum of 15% student discount of the RRP will apply. In addition, orders placed and paid for at the bookstall will be delivered free of charge. A message from CLC: Many things are worse than finding that the last copy of the book you wanted has just been bought, but why run the risk? Just send an email to sheffield@clcbookshops.com as soon as you can and whatever you are interested in browsing can be set aside for you – with no obligation to buy. Please use MBC bookstall as your subject line, if possible. Bear in mind that we’ll have to order anything that’s out of stock or print-on-demand, so don’t delay in sending your request/s. We look forward to seeing you on the 8th! We are super organised so you can save the dates for the next MBS programme. We will be announcing the programme over the coming months and details of how you can register. In the meantime, you can scroll down this page to see some of the topics that we’ve covered this spring. We hope you find this list of dates helpful and we look forward to seeing you over the coming year. NEW for 2020, MBS Summer Sessions! We’re excited to announce that we will be creating more choice and flexibility to study through MBS by adding another 5 sessions to our annual programme from June 2020. Save the dates! Each course costs £35, or £25 for the unwaged.